An Indiana police officer killed in the line of duty last week saw his son off to school hours before his death, an interaction seen in a touching photo released by his department. 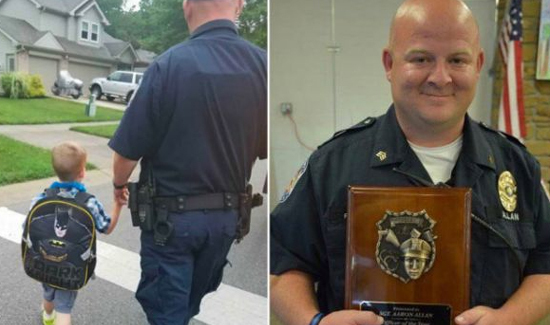 Southport Police Department Lt. Aaron Allan walked his son to the bus stop on his first day of kindergarten on the day he was killed, police said. “The child, nor his father, knew this would be the last time they saw each other,” the Fremont Police Department wrote on Facebook along with the photo. Allan, who has two sons, was responding to the scene of a car crash in Southport to aid a driver who crashed through a fence and flipped his car. But the driver, 28-year-old Jason Brown, then allegedly shot Allan multiple times. Allan later died at a local hospital. Allan was an officer with the department for six years and had worked in law enforcement for 20 years.